Israeli Ambassador to Britain Daniel Taub subject to protests at LSE; students even pulled the fire alarm. 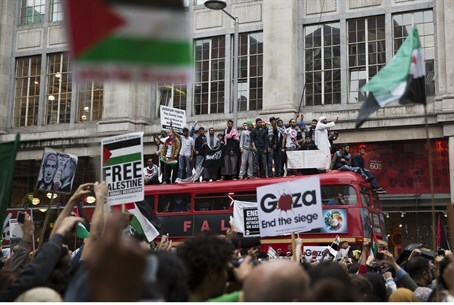 British students launched fierce protests outside the London School of Economics Tuesday, Channel 2 reports, during a speech being given by Israeli ambassador to Britain Daniel Taub. "Shame on you!" protestors shouted. "Free Palestine!" One student bore a placard stating, "murderers not welcome at LSE." About 100 students attended Taub's speech in a prestigious hotel in central London, according to Channel 2, with the talk entitled "Israel and the Middle East: challenges ahead." The event was held in partnership with the LSE Students’ Union (SU) Politics and Forum Society and the LSESU Israeli Society and chaired by Professor Toby Dodge. A group of 5-6 young men walked out, apparently setting off the fire alarm as they did so, temporarily disrupting the event. Within three minutes, however, it was shut off. "Tonight's event with His Excellency Daniel Taub highlighted the importance of open dialogue and frank debate," LSE Politics Society President Chris Hulm responded. Hulm is a third-year Government student at the school. "While some try to entrench division between opposing views, and others can shy away from the harsh reality, the event underlined why negotiation and agreement can only be fostered by facing up to the difficult questions." "I applaud the Ambassador for his honesty and integrity this evening," he added. Taub was accompanied by a considerable security detail, since the university is known for its hostility against Israel. Just last week, there was an event organized by the University's Student Union Palestine Society, in cooperation with student feminist groups, which supported female suicide bombers against Israel. "I was approached by a number of people saying I shouldn’t come to the LSE because of an event last week," Taub noted. “Praising suicide bombers is a betrayal to those Palestinians who want to educate their children in order to bring about peace." The Israeli Embassy in the UK noted that, despite the interruption, the event was ultimately a success - and that students engaged with the ambassador to discuss regional and national issues.